Hazelnut or Filbert – Corylus avellana L.
The hazelnut belongs to the Betulaceae or Birch family, along with other important forest tree species and ornamentals: Betula (Birch), Alnus (Alder, N-fixing trees), Carpinus (Hornbeam, landscape tree), Ostrya (Hophornbeam or Ironwood, landscape tree). Corylus avellana L. is one of 9-20 recognized species in the genus, all of which produce edible nuts which are collected from the wild by humans and are important sources of food for wildlfe. The name “Hazel” comes from the Anglo-Saxon word for bonnet, “Haesel”; this probably derives from the greek “korys” (as in Corylus), for helmet or hood. The term “filbert” may have derived from “full beard”, descriptive of the long, leafy husk. The cultivated hazelnut is native to Europe and Asia Minor, preferring regions with mild, moist winters and cool summers. For this reason, most production is located near large bodies of water at mid latitudes in the Northern Hemisphere (along the Black Sea in Turkey, the Atlantic coast in France, the Willamette Valley in Oregon). Hazelnut production failed initially in the eastern US due to eastern filbert blight (Anisogramma anomala) a fungal disease which attacks young shoots first, but later invades older wood, girdling and killing the trees and entire orchards. In the 1970’s, it was found in the Pacific Northwest, where it threatens production. World (2004 FAO) – 699,939 MT (1.5 billion lbs), shelled basis. Produced in 25 countries on 1.2 million acres. Yield fluctuates between 1150 and 1450 lbs/acre since it is alternate bearing. United States (2004 USDA) – 33,600 MT or 74 million lbs of in-shell nuts. Produced largely in Oregon on 28,000 acres. Industry value fluctuates between $18-35 million with production, but was over $50 million in 2004. Prices received by groawers range from 32 – 50 ¢/lb. Exports are 13-33% of the annual crop. Plant: Large shrubs (10-15 ft) in Europe, but trained to a single trunk in the Pacific Northwest to facilitate mechanical harvest. Trees begin bearing when 3-4 years old, and can bear for up to 40-50 yr. Trees commonly produce 20-25 lbs of dried nuts each. Leaves are 2-3″ long, broadly ovate, acuminate, slightly lobed with doubly serrate margins. 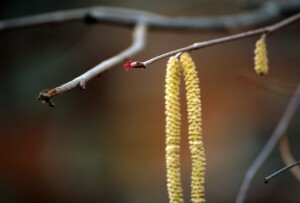 Flowering, pollination: Monoecious, dichogamous habit, female flowers are borne in head-like inflorescences terminally on short shoots developing from lateral buds on 1-yr wood (borne on current season’s growth, although it appears to be 1-year-old wood as extension growth at flowering is severely limited). 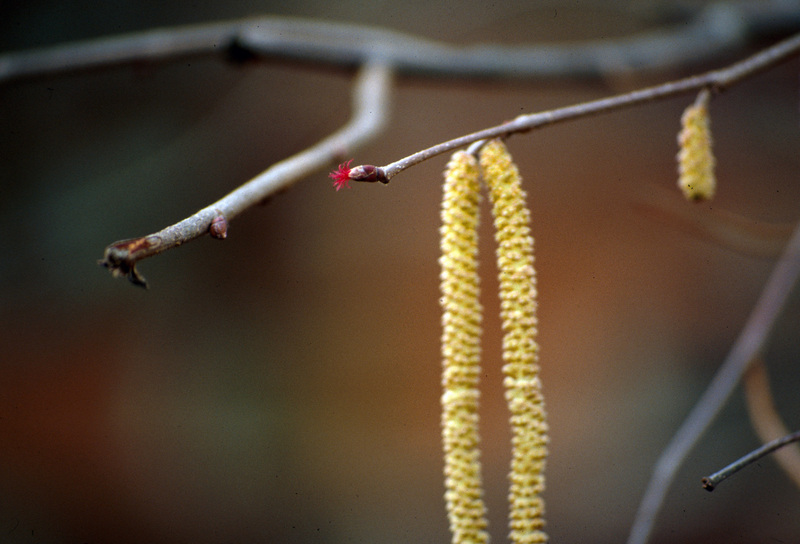 Male catkins are borne from unmixed lateral buds on 1-yr wood. Most filberts are self-unfruitful. Flowering habit is unusual. Both and flowers are initiated the summer prior to harvest. Female flowers lack perianth and ovaries at the time of pollination in mid-January to mid-February; the pollen tube grows to the base of the style and becomes quiescent until 5-6 months later (June), when the ovary and ovule develop. Fertilization then takes place in July, and the nut rapidly develops, maturing by late August. 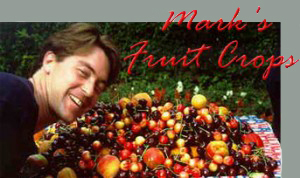 Fruit: a nut in clusters of 1-5; shape varies from round to oval, to oblong, and resembles the appearance of an oak acorn. The pericarp is hard, loosely covering the smooth to shriveled kernel. 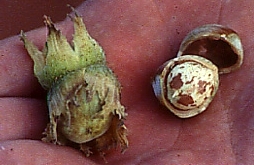 Nuts are surrounded by a green, leafy husk (involucre), and abscise from the base of the husk in late august. 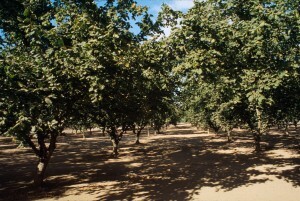 In Europe, hazelnuts are generally non irrigated, being planted in areas with adequate rainfall and high humidity (maritime climates). The level of management in Turkey is low, with bushes planted in clumps, often on steep hillsides, and harvested by hand. In the Pacific Northwest, the deep, fertile soils of the Willamette Valley do not require irrigation. Pollinizer placement was 8:1 (every 3rd tree in every 3rd row), but has been increased to 17:1 in many cases (every 6th tree in every 3rd row) since pollen can travel about 60 ft. Tree spacing is generally triangular or square, with 10-20 ft between trees; this gives densities of 150-250 trees/acre. Vigor gradually declines over 5 yr period, so every 5th row is severely pruned each 5 years to stimulate new productive wood; only thinning cuts are made. Yields are drastically reduced the year of pruning, since flower buds are removed, but trees yield high for 2-3 years after pruning. Alternatively, trees can be lightly pruned every other year, preferably in the “on” year, to maintain more consistent yields. Propagation is accomplished largely by simple layerage, but traditionally was by removing suckers from existing trees. However, suckers do not produce as efficiently as layers. Harvest is by hand in most of Europe, but mechanized in the US. Nuts drop naturally during a 6 week period beginning in September. Winds or helicopters can remove the last remaining nuts. The orchard floor is mowed closely, and kept free of debris to facilitate windrowing and sweeping of nuts. Debris is blown from the nuts, which are washed in mild chlorine to reduce surface contamination, and bleached by exposure to SO2 to enhance appearance. 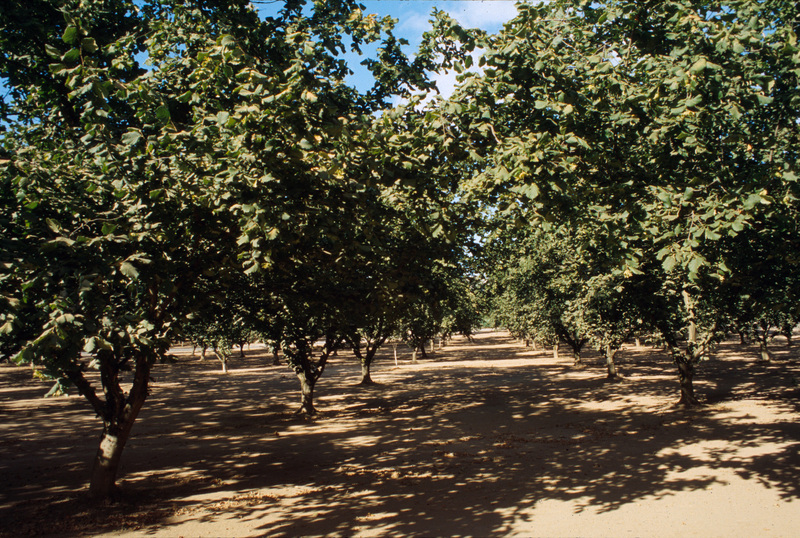 Filberts are dried to 8-10% moisture, permitting storage for up to 1 yr at 36-40 F.
Most of the crop is utilized immediately for the holiday market (Halloween, Thanksgiving, and Christmas). Premium nuts are sold in-shell, and exported; currently this is only 5-10% of the market, but growing. A large portion of the crop is cracked and kernels are used for cereals, confectionery (mostly in baked goods) and in canned mixed nuts. Per capita consumption is the lowest of all tree nuts, 0.07 lbs/year.